About the size of a sesame seed, a new species of wasp from Costa Rica, named Dendrocerus scutellaris, has elaborate branched antennae that could be used for finding mates. Or hosts. The new insect is described by PhD candidate Carolyn Trietsch, Dr. István Mikó and Dr. Andrew Deans of the Frost Entomological Museum at Penn State, USA, together with Dr. David Notton of the Natural History Museum in London, UK. Their study is published in the open access Biodiversity Data Journal. The wasp is a parasitoid, meaning that its larvae feed on a live host insect. There are two types of parasitoids: ectoparasitoids, which lay their eggs on or near the host, so that the hatchling larvae can attach to and feed on the insect from the outside; and endoparasitoids, which lay their eggs directly inside the host, so that the larvae can eat them from the inside out. Unfortunately, to puzzle out the new wasp’s lifestyle, the researchers could only rely on specimens collected back in 1985, which had spent the past few decades stored in the collections of the Natural History Museum of London before being loaned to the Frost Museum at Penn State for research. 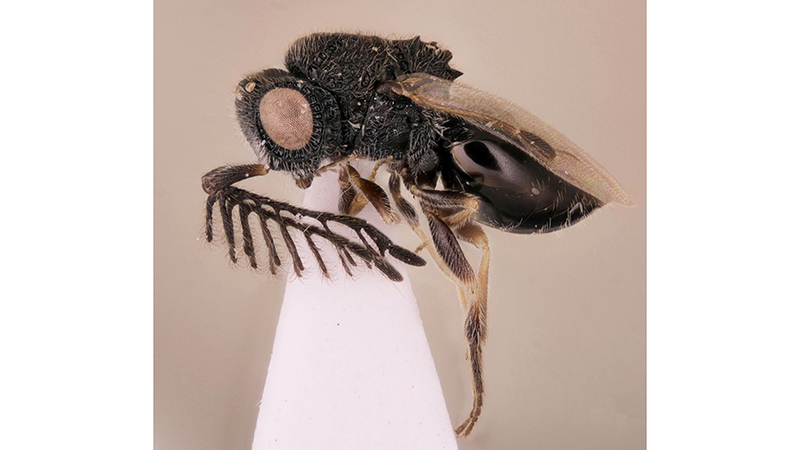 What can you learn about a wasp’s lifestyle from specimens that are over 30 years old? Even though the new species has never been observed in the wild, researchers managed to learn a lot by looking at the wasps’ morphology, concluding that the species is likely an endoparasitoid. The larva of an endoparasitoid wasp needs a safe place to develop and mature, so when it is done feeding on its host, it may stay inside the host’s body where it can develop undisturbed. Once it is fully grown, the adult wasp either chews or pushes its way out, killing the host if it isn’t already dead. Unlike its close relatives, the new species does not have pointed mandibles for chewing. Instead, it has a series of spines along its back. While the wasp is emerging, it may rub these spines against the host and use them like a saw to cut open the body. Once emerged, it flies off to mate and continue the cycle. It is currently unknown what the new species feeds upon, but naming the species and bringing it to attention is the first step in learning more about it.